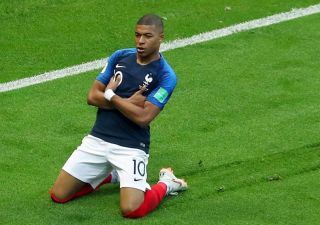 How to watch the 2018 World Cup final – TV, 4K, online, mobile, VR | What Hi-Fi? The 21st edition of the FIFA World Cup ends with the Croatia v France final taking place today. As is now typical for major sporting events, the World Cup TV coverage is bursting at the seams with technical innovation, from 4K broadcasts to virtual reality, and there are plenty of ways to keep abreast of what's left of the action, whether you're at home or out and about. So if you're looking to catch the action on your TV, watch online or listen to the radio, here's what you can expect from the last weekend of Russia 2018. The 2018 FIFA World Cup kicked off on Thursday 14th June, and there's just the final game left to go now. *These BBC One matches will be broadcast in 4K on BBC iPlayer. If you're watching the final on your sofa in the UK, then you have a choice between the BBC and ITV. SD and HD broadcasts come as standard. But what about 4K matches? The BBC has shown 28 of its 29 4K HDR World Cup matches and will offer the final this way too, but ITV isn't providing a 4K option. The BBC's presenters and pundits include Alan Shearer, Frank Lampard, Rio Ferdinand, Cesc Fabregas, Phil Neville, Jermaine Jenas, Alex Scott, Jurgen Klinsmann, Didier Drogba and Pablo Zabaleta. ITV signed Gary Neville as a pundit. Alongside him is a lengthy list that includes Ryan Giggs, Roy Keane (a man who's never knowingly met anyone he respects), Lee Dixon, Ian Wright and Martin O'Neill. Henrik Larsson, Slaven "I don't care" Bilic and Eniola Aluko will also provide their views. Mark Clattenburg is there too, offering his take on refereeing decisions as well the tournament's interesting use of the VAR system. Jacqui Oatley and Mark Pougatch are on presenting duties, with Clive Tyldesley, Jon Champion and Glenn Hoddle commentating on the action. This is the first true 4K Ultra HD World Cup. Brazil 2014 had several matches produced in 4K, but 2018 has seen FIFA team up with Sony to deliver all 64 matches in native 4K HDR. Each stadium had 37 cameras shooting footage, eight of which will are outputting in UHD/HDR, the UHD broadcast benefitting from immersive audio. FIFA hasn't offered Dolby Atmos or DTS:X - broadcasts are in standard stereo. Dolby's object-based surround audio has been used by BT and Sky for sporting events in the past. Sky Germany is showing a total of 25 matches in 4K, while Switzerland is on board, too. Hisense, one of the tournament's key sponsors, has revealed US customers can watch 4K games via its special app. One stumbling block for 4K in the UK, was that neither the BBC nor ITV had the means to broadcast 4K content. The BBC made headway in developing its 4K pipeline, successfully trialling Blue Planet II on iPlayer back in 2017. Blue Planet II was broadcasted via the iPlayer in Hybrid Log Gamma HDR, a format developed by the BBC and Japanese state broadcaster NHK. Following that trial, the BBC ran its first ever live 4K sport broadcast in April 2018, streaming a rugby league match in Ultra HD and HDR on the iPlayer beta app. This was followed by another 4K iPlayer trial, this time on the second-half of the FA Cup Final, in UHD and HLG on iPlayer. The BBC's 4K World Cup trial does come with a few caveats. The 4K stream is available to tens of thousands of viewers, but it's being offered on a first-come, first served basis. As soon as the quota is filled, any latecomers will be unable to view it. The Beeb has made a total of 29 games available in 4K. You will need a compatible 4K TV with the latest iPlayer app, and you can find out which models are included on the iPlayer website. HLG (Hybrid Log Gamma) will be used to improve the picture quality on both HDR and SDR enabled devices. You can also add Sony's PS4 Pro to the list of compatible devices. A recent update to its iPlayer app (version 2.0), means you can access the live 4K trial through that gaming console. Footage is beamed at 50 frames per second, with a 40Mbit/s connection required for the full fat 3840 pixel UHD experience, or 20Mbit/s for a 2560 pixel UHD stream. Unfortunately, the BBC has confirmed neither Atmos nor DTS:X will be available. Elsewhere, NHK has made a firm commitment to developing 8K TV or Super Hi-Vision, as it's also called. Yes, 8K. In 1015, it was announced that NHK and FIFA had plans to produce matches in 8K for this World Cup. It is believed that NHK will use the World Cup as another proving ground for its 8K pipeline. Both FIFA and NHK have prior form in this respect, as the 2015 Women's World Cup saw several games produced in 8K. Your best options for watching the World Cup online will be BBC iPlayer, the BBC Sport app and the ITV Hub. BBC's online content is on the iPlayer, and in 4K with compatible TVs. BBC Sport's digital service delivers HD video coverage of the corporation's matches, and you'll find highlights on here as well as on the BBC's YouTube channel. When it comes to catching up on live sports, the iPlayer tends to carry content for at least seven days after its initial transmission. The ITV Hub is similar. The iPlayer is ad-free (but don't forget to pay your licence fee), and while the free version of ITV's Hub player carries ads, for £4 you can sign up to ITV Hub+, available across desktop, iOS and connected TVs. The fee removes ads and lets users download shows through the iOS app (iOS 10 and above). Like Now TV, there's no contract and you can leave whenever you want. As the official TV sponsor of the tournament, Hisense has a special app for some of its US models that will stream matches in 4K. There's also FIFATV on YouTube. It has highlights packages, along with interviews, previews and full replays of classic matches from previous World Cups. But if that doesn't float your boat, Copa90 offers engagement on the World Cup from a supporter's perspective, with interviews and short productions on fan culture. On mobile, you'll find content on BBC's iPlayer, BBC Sport, ITV's Hub player and YouTube, mirroring the TV coverage, as well as plenty of activity across social media. The BBC Sport app has pushed alerts (if you choose to opt-in) for goals, half and full-time results, and even starting line-ups. FIFA has its own official app where you can keep track of scores, read live blogs, view photos and watch match highlights and exclusive videos. And for those keeping track of the ins-and-outs of the tournament through podcasts, the likes of Football Weekly, The Football Ramble and The Totally Football Show have featured a regular dose of round-ups, previews and reviews, dissecting the tournament's most notable topics and trends. As well as confirming matches in 4K, the BBC caught everyone by surprise by announcing it would bring the World Cup to VR audiences through a dedicated app. Called BBC Sport VR - FIFA World Cup, it's free to download on Apple (iOS 10 and above), Android (Lollipop and above), Gear VR, Oculus Go and PlayStation VR. Anyone with a compatible app and VR headset will find themselves in their own luxury private box in a Russian stadium. The game can be viewed from a giant window that lets the viewer feel as if they're in the stadium. A connection of at least 10Mbit/s is recommended for VR. On the UK radio side there are two options: talkSPORT, whose coverage included exclusive interviews and live commentary of every match, and BBC 5 Live, which offered ad-free coverage of all matches. The only question remains, who's going to win it? Croatia? France?